Of the various measures that can drive building performance towards net zero, passive measures are the most preferable. They result in durable construction, increased comfort, health, and resiliency, and are the most cost-effective, up to a point. In the larger picture, conservation plays a critical role in scenarios trying to shift the current energy economy towards a sustainable energy economy. Stringent conservation guidelines are necessary in addition to the aggressive build out of renewable energies so that the targets can be met. In late 2011, a volunteer Technical Committee (TC) was formed at PHIUS, and was tasked to work on standard adaptation, among other things. The involvement of the committee set the frame for the work reported here. In 2012, the U.S. Department of Energy (DOE) recognized the value of performance-based passive building standards when it joined with Passive House Institute US (PHIUS) to promote DOE's Challenge Home program in tandem with the PHIUS+ Certification program. Since then, the number of passive building projects that have been certified under the partnership has grown exponentially because of some synergy. Passive building represents a well-developed approach to arrive at the envelope basis for zero energy and energy-positive projects by employing performance-based criteria and maximizing cost-effective savings from conservation before implementing renewable energy technologies. The Challenge Home program evolved into the Zero Energy Ready Home (ZERH) program in a move toward 1) attaining zero energy and 2) including active renewable energy generation such as photovoltaics (PV)—toward the zero energy goal. A synthesis of the two programs, PHIUS+ and ZERH—which combines optimized performance- based envelope design guidelines and zero energy goals—has the potential to make net zero energy a mainstream market force. But experience to date has identified a critical obstacle to wide-scale adoption across the nation: the passive/conservation performance metric currently used as the envelope design guideline for space-conditioning criteria (following the German Passivhaus standard) is not responsive to the wide diversity of climate and energy market conditions in the United States. Passive design principles (superinsulation, airtight envelopes, elimination of thermal bridges, etc.) were pioneered in North America in the 1970s and 1980s and refined in Europe in the 1990s. These principles are universally effective in significantly reducing heating and cooling loads. 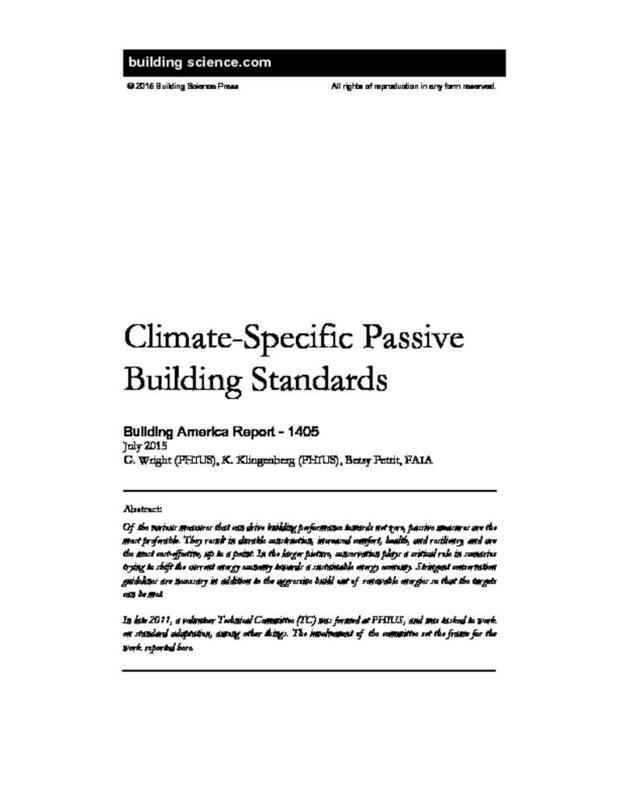 However, a single rigid performance metric developed in Germany has led to limited uptake of passive building principles in many regions of the United States. It has also sometimes promoted design decisions that had negative effects on economic feasibility and thermal comfort. Validate (in a theoretical sense) verifiable climate-specific passive standards and space- conditioning criteria that (1) retain ambitious, environmentally necessary energy reduction targets and (2) are economically feasible. Such standards provide designers an ambitious but achievable performance target on the path to net-zero energy. Develop simplified formulas for inclusion in a design and verification software tool that allows custom criteria to be generated based on specific climate and energy cost parameters for any particular location. The approach to arrive at this new set of criteria is to critically reevaluate the current German- derived criteria in light of the issues discovered. A volunteer technical expert advisory council called the PHIUS Technical Committee (TC) has assisted the authors in the process; the results presented here reflect consensus votes by this volunteer expert body. Airtightness requirements to ensure that highly insulated envelopes do not develop moisture problems that will lead to significant failures of the envelope components. Cost-optimize an energy-saving upgrade package for a study building in 110 climate locations in North America. Note the heating and cooling load performance achieved. Curve-fit the data to local climate parameters such as degree-days and design temperatures. The optimizations are constrained with strict airtightness requirements and minimum window U-values to ensure that building durability and winter comfort are not compromised in the quest for energy savings. The result is a set of simple formulas that can be embedded into building energy modeling software to set the heating and cooling criteria for any location in which the local climate parameters are known. The German-derived source energy and airtightness criteria were reevaluated. Although the new- space conditioning criteria would still be based on floor area (using a new simplified conditioned floor area), the proposed source energy and airtightness criteria will use different scaling rules. The airtightness limit will scale with envelope surface area instead of building volume. A commensurate change from ACH50 measurement to CFM50/ft² of gross envelope area is recommended; the source energy limit for residential projects would scale per person based on design occupancy instead of on floor area. This limit would remain consistent with the global total carbon dioxide emissions limits brought forward by the Intergovernmental Panel on Climate Change. The airtightness requirement was reconsidered on the basis of avoiding moisture and mold risk. The proposed change is from a limit of 0.6 ACH50 to 0.05 CFM50/ft2 of gross envelope area (or 0.08 CFM75). This change allows the airtightness requirement to scale appropriately based on building size. Change to a per-person limit rather than a limit measured by square feet of floor area for residential projects. Correct the source energy factor for grid electricity in the calculation protocol to 3.16, which is consistent with the U.S. national average. Adopt lighting and miscellaneous plug load defaults at 80% of the Residential Energy Services Network standard. Set the source energy limit to 6,200 kWh/person/year and tighten it to 4,200 kWh/person/year within a few years. Apply the limit to the source energy calculated net of the estimated fraction of on-site PV or other renewable electricity generation that is used on site as it is produced. This accounts for PV the same way solar hot water is accounted for. Shift to mandatory thresholds on annual heating and cooling demands and peak heating and cooling loads that are climate specific to a project’s location. These thresholds are aimed at a near-optimal “sweet spot” with slightly more energy savings than would occur at the cost-optimum point calculated by the Building Energy Optimization software. This shift will ensure that efficiency measures will be reasonably cost-competitive and will provide some increased resilience benefits. Adopt a simplified inclusive interior-dimension reference floor area. The outcome of this study yields a cost-effective performance-based standard that would reduce energy consumption in buildings on a national average by an estimated 86% for heating and 46% for cooling; the peak heating load (and system size) would be reduced by 77% and the peak cooling load would be reduced by 69%. Total source energy use would also be reduced for buildings consistent with limiting global temperatures from warming by more than 2°C. By its structure, the proposed standard addresses three hurdles to source zero energy. The designer’s attention is directed first to reducing heating and cooling energy use by passive means (including the use of some mechanical devices), then to reducing total energy demand by using efficient equipment (and some renewables), and finally to source zero energy by additional renewable energy generation. The authors recommend adopting the standard as the basis for the next-generation ZERH as cost- competitive envelope guidelines to achieve zero energy and active generation. Given the large proportion of energy used in buildings (40%, according to the U.S. Energy Information Administration [EIA 2013]) and growing consensus about the economic and social costs of climate change, a movement to decrease energy demand through conservation and to increase the use of renewables is coalescing. In 2010 the European Parliament committed to broad levels of carbon reductions per the Kyoto Protocol to the United Nations Framework Convention on Climate Change. The protocol called for adopting passive building strategies and scaling up renewable energy supplies. The European Union committed its members to reaching near zero energy buildings by 2020 (EU 2010). Europe has always focused on performance metrics. In recent years—beginning with the German Passivhaus performance standard—the passive design methodology has gained widespread adoption. Variations on that approach and metric have been codified in countries such as Belgium, Sweden, and Switzerland. (Jacobson 2013; Dockx 2013). Similar efforts are underway in the United States. For example, the 2030 Challenge by architect Ed Mazria calls for buildings to be carbon neutral by 2030. The U.S. Department of Energy (DOE) has led efforts to improve building energy performance through programs such as Building America (BA). In 2012, DOE recognized the value of performance-based passive building standards when it joined with Passive House Institute US (PHIUS) to co-promote DOE’s Challenge Home program. Challenge Home was an evolution of the successful Builders Challenge program. In 2014, Challenge Home was renamed the Zero Energy Ready Home (ZERH) program; it emphasizes that homes are being designed to accommodate renewables. The PHIUS+/ZERH partnership remains significant for several reasons that are discussed in Section 1.1.1 through Section 1.1.4. By recognizing the PHIUS+ program—which is fundamentally a performance-based standard with a prescriptive component related to ZERH requirements—ZERH acknowledged the value of performance-based standards in general and of the passive building standard in particular. This is a critical recognition in a historical context. In 1970, the White House Council on Environmental Quality issued its First Annual Report along with a presidential message to Congress (Train et al. 1970). The report included a comprehensive analysis of the environmental threats that face the United States and made the case for establishing the U.S. Environmental Protection Agency. Notably, the report called attention to the possibility of climate change. Once the U.S. Environmental Protection Agency was established, its attention to environmental issues combined with the OPEC oil embargo in 1973 led to significant government funding of energy-efficiency research (ASE 2013). The first commercial energy-efficiency design guidelines were established by ASHRAE and published in 1975 as Standard 90-75. The guidelines were later renamed the Model Energy Code and further iterations followed. The Model Energy Code is the predecessor to today’s ASHRAE 90.1. Significantly, in 1976 the first proposed federal legislation and national building energy code specified a performance-based approach rather than the now-familiar prescriptive/checklist improvements over a baseline home. The proposed legislation required all buildings to meet an energy target per square foot as verified by a computer model. In the face of opposition from the building industry, the performance-based requirement was replaced by a prescriptive approach in the legislation that was eventually enacted. The subordination of the performance-based requirement had a longstanding effect on the development of codes and efficiency programs. In 1994 the nonprofit International Code Council was founded. It published the first edition of the International Energy Conservation Code (IECC) in 1998 and has since issued revisions in 3- year code cycles. The resulting improvements (by estimated percentage) over the first guidelines published by ASHRAE in Standard 90-75 that followed are shown in Figure 1 by each iteration and then by versions of IECC (EIA 2008). The data from 2006 IECC to 2012 IECC (ICC 2012, not shown here) represent another major 30% reduction. Although code has trended toward greater energy efficiency, lawmakers and policymakers are challenged to accurately assess actual energy-efficiency performance—and improvements—of the built environment in absolute and measurable terms. That is because quantifying and verifying actual performance improvements is not the main objective of a mostly prescriptive regime. Prescriptive standards apply a linear, additive approach of individual measures that fail to look at buildings as systems and fail to account for the “whole being larger than the sum of its parts.” Synergies cannot be accounted for unless a building system is modeled intentionally to exploit them during the design process with a model designed for that purpose. Therefore, an integrated design process that is guided by appropriate performance targets would yield greater efficiencies than conventional building design methodologies and energy accounting. Europe’s building energy codes have traditionally followed the performance-based model; high- performance programs or low-energy home designations are characterized by absolute energy metrics or energy use intensity indexes as benchmarks to govern various levels of energy use in buildings. Buildings can then be directly compared in terms of their energy use intensities and can progress toward absolute efficiency goals. The recognition of the PHIUS+ program by ZERH is a step toward leveraging the advantages of performance criteria and toward alignment with international approaches to energy and carbon reduction efforts. The fundamental principles behind passive building—superinsulation, airtight envelopes, etc.— were developed in the 1970s and 1980s in the United States and Canada. Much of that work was done with government funding that responded to environmental, economic, and geopolitical crises. The terms passive house and passive housing were coined by early Canadian pioneers in the 1970s (Dumont et al. 1978) and were later used by the renowned physicist William Shurcliff in the 1980s and others (Shurcliff 1982, 1986). The term passive expressed then (as it does today) an effort to reduce heating energy consumption in buildings to nearly zero by limiting heat loss and optimizing gains via insulation, high-performance windows, and airtightness. Envelope performance is guided by the low peak load design tenet that provides resiliency as a prime benefit: the home needs only a “micro-load” mechanical backup system for normal operation and can “coast” thermally through power outages. By 1986 many homebuilders were designing their homes accordingly and Shurcliff declared the technology mature (Shurcliff 1988). By the end of the 1980s as many as 30,000 of these homes had been built in the United States and Canada (Nisson and Dutt 1985). As interest in conservation and efficiency foundered in North America (Biello 2010), the German physicist Wolfgang Feist—initially with Swedish Collaborator Dr. Bo Adamson and continuing today at the Passivhaus Institut (PHI)—continued to refine the principles and develop a modeling tool and an energy metric known in German as Passivhaus. The first convincing German research project that employed the low-load home design tenet was a four-townhouse development in Kranichstein in Darmstadt Germany that was completed in 1991. The project reduced energy demand and system size by a factor of 10 in the central European climate zone. The passive metric developed from this effort guided designs toward very low peak loads. Since PHIUS and DOE announced the alignment of the PHIUS+ program with the Challenge Home program (now ZERH), the growth in PHIUS+ Certified projects has increased dramatically. The growth continues (see Figure 2). The fastest-growing typology is multifamily—large multiunit projects are underway and many more are in the planning stages. In Europe, the uptake of passive building principles provided incentives for manufacturers to innovate and produce a growing range of high-performance building components including doors, windows, air-sealing products, and ventilation equipment. The increased uptake of passive houses in Europe has also produced economies of scale that have reduced the prices of premium components significantly. This development has effectively created an entirely new market segment and economic opportunities. The same dynamic is operating in North America. PHIUS launched a window certification program concurrently with the PHIUS+/ZERH program. The PHIUS Certified Data for Windows program analyzes manufacturer-supplied data and evaluates products for suitability in Passive House projects by climate (using the standard ASHRAE/DOE North American climate zones). Since the launch of the program, 10 manufacturers have submitted hundreds of models for evaluation; 130 models have been recommended for at least one climate zone. Significantly, the roster of manufacturers includes mostly domestic companies including a very large mainstream window firm Marvin Windows and Doors. Combining passive building principles and low peak load design tenets with a zero energy target has an intrinsic logic: reduce demand and peak loads to a point at which the envelope improvements are cost-effective and all the building’s needs can be met with a minimized and affordable and active renewable energy system to reach zero energy. Designers and builders are recognizing passive house as a critical path to zero. Based on the growth shown so far, the combination has potential to make zero energy—achieved via passive building—into a mass- market phenomenon. However, a significant obstacle to wide-scale adoption remains; removing that obstacle is the motivation of the work and results described here. The problem is that passive performance targets have not been optimized by climate zone. Until now, the European energy metric of 4.75 kWh/ft2 annual load has served as a one-size-fits-all design target for all climates. In some climates this has led to very costly projects; in others it has produced significant thermal comfort issues. In short, that metric has led to poor design decisions in climates that are significantly different from the central European zone with its moderately cold heating-dominated climate. Even though the underlying Passive House design principles have proven effective in all climate zones, a one-size-fits-all performance target has proved to be a disincentive in many climate zones. Some history of the European standard’s application in the United States is in order. In 2002 PHIUS cofounder Katrin Klingenberg completed a Passive House proof of concept for the United States—the Smith House, which was a single-family home that significantly reduced energy consumption (Stecher and Klingenberg 2008). It was followed a few years later by the two houses (Fairview I and II) built by e-co lab, which was a community housing development organization. These houses were also monitored and tested by the DOE BA partner IBACOS. A BA report was published about Fairview II (Stecher and Allison 2012). PHIUS was founded in 2007 and has since trained 1,800 professionals and become the leading Passive House project certifier in North America. From the beginning, PHIUS’ work in the United States was informed by—but was mostly independent from—the German institute. That was by necessity because North America’s multiple and more extreme climate zones presented different challenges for passive building than do the zones in the central European climate. Almost every project offered a new climate challenge. These circumstances sometimes resulted in projects that had the same overheating problems as early “mass-and-glass” designs from the 1970s. In other instances—in Louisiana for example—the German-derived standard did not account for humidity loads and predicted cooling demands inaccurately. Driven by building science, PHIUS sought to resolve the new issues presented by multiple and more extreme climate zones in the United States. It drew on the original writings and research done in North America in the 1970s and 1980s and the good work of the Germans. PHIUS then collaborated with leading building science experts in the United States and Canada such as Building Science Corporation. Although PHIUS and the Passive House community have enjoyed substantial success, a review of hundreds of projects across North American climate zones showed clearly to PHIUS and the growing community of Passive House practitioners that the German Passivhaus standard was significantly challenged and cost-prohibitive in vast areas of North America. In areas such as the Pacific Northwest, uptake of Passive House has grown quickly because the climate is similar to that in which the German standard was derived. But in others, the energy target has been a disincentive to using Passive House as a platform for zero energy. The work described here aims to retain the proven value of passive design techniques (optimizing the envelope for example) and to use the National Renewable Energy Laboratory’s Building Energy Optimization (BEopt™) tool to set new passive building metrics that reflect climate-specific requirements, national construction costs, and regional energy costs. The main objective is to propose a standard that makes such necessary adjustments and can function as an easy-to-understand and use proxy for “how far to go” first with passive measures before adding efficient systems and renewable energy systems. The goal is a simple yet fine-grained performance-based design methodology that guides the designer to identify the most cost- effective path to zero with the greatest overall benefits to building owners and society. The work retains the ambition of the Passive House movement to reduce building energy requirements and carbon footprints, all while creating supremely comfortable and resilient buildings and spurring innovation in building science and in the building component industry. The refined climate-specific passive building standard is proposed as the basis for the next- generation ZERH. A fundamental premise of this study is that performance-based metrics are useful to advance national and global energy and carbon reduction goals. ZERH and PHIUS+ are already employing performance-based guidelines and agree on this premise. PHIUS brings a methodology to the table that employs passive building techniques that prioritize savings from passive measures; ZERH brings to the table (1) a methodology through BEopt to evaluate the cost-effectiveness of all measures and (2) a strong approach to field quality assurance. . .